Faraone Srl, an Italian provider of architectural components, was tasked with designing a new full glass balustrade with a special aluminum profile at the bottom to hold the glass structure in place. With the challenging goal to save on development time, material, and production costs, while increasing the stiffness of the aluminum profile, the development engineers at Faraone looked for a new design strategy and special optimization tools to help reach these goals. They found their solutions with Inspire. The company strengthens its leading position in the market by continuously investing in state-of-the-art analysis tools, technology research and the development of new, innovative products. Design plays a fundamental role in all new Faraone products and designers and engineers work in teams to find the smarter solutions for every new product. Gabriele Romagnoli, head of structural engineering at Faraone, is in charge of product development and testing. In a typical development process, Romagnoli and his team receive an initial design proposal from the design team and architects. 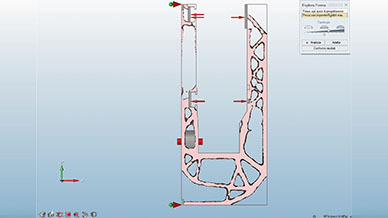 After an evaluation of the design sketches, the engineering development of the part has to focus on aspects such as thicknesses, material, keeping the original shape as close as possible to the original sketch. In Faraone’s recent project, the engineers chose a new development path. This time the engineering team started from zero and used simulation and optimization to drive the design. They first created a simple profile and used it to perform a topology optimization of the profile in Inspire. The optimization results inspired the final design, which was refined by the design team, and lastly validated in Inspire. A typical optimization process follows these steps: Creation of the design space and application of loads and boundary conditions. 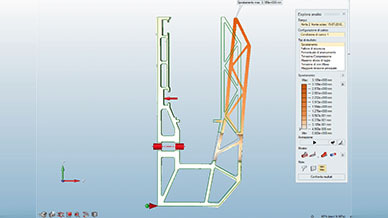 The optimization tool uses the input to propose an optimal structure. The design proposal offers the best possible combination of lightweight and structural efficiency. Subsequently, the part is quickly refined to define the final shape, which is then again analyzed with Inspire to verify its structural performance. As safety is paramount in architectural constructions, the engineers usually apply additional safety factors when optimizing a structure. In this case, Romagnoli increased the load by a factor of 1.5. That means in some cases the engineers apply a load of 300 - 450 kg per linear meter. Starting with a static analysis, a buckling analysis followed, to check if the profile may suffer from local buckling. The design validation of the profile considers deflection, stress, and buckling. Because of these standards, all products have to be physically tested to confirm the simulation results. With HyperWorks and Inspire in place, all simulations can be handled in-house by Faraone's engineering team, which in addition to the software delivering reliable results, helps the engineers to come to a testable product much quicker than before. Inspire does not only help to save time and to reduce weight and material: additional benefits, like fast learning curve, become obvious when compared to other solutions available on the market. "I found Inspire to be a very quick tool to learn, which was super easy to work with because it is so user-friendly. The great thing about Inspire is that designers, civil engineers, and architects, who are not yet that familiar with optimization and simulation technology, can also use it. I chose Inspire because of its very user-friendly interface, and its accurate analysis results," said Gabriele Romagnoli. Inspire helped to reduce the weight of the profile by roughly 20 percent, and considering that the material used in this project is aluminum, it is a significant cost reduction. On a linear meter, which weighs around 7 kilos before the optimization, Faraone could save around 1.5 kg. Even if only counting the material saving, Inspire has already paid off with the first project we used it for. Romagnoli confirms: "I would say the ROI for Inspire is outstanding, and we are very happy with the results. I can compare a wide range of results from Inspire and I can resolve almost any simulation task myself, and it is easier to handle almost every analysis within one software." Steel and glass staircases and curtain walls are the most recognizable items produced by Faraone Srl. Faraone was one of the first companies to adopt the innovative technology of the point-fixed glass system, and quickly became a leader in the field. This position is strengthened by means of continuous investment in technology research, the development of product lines and special attention dedicated to services, following a total quality model. Passion, continuity and professionalism are fundamental qualities that Faraone offers to its partners.